My last picture for now from Pollok Park – near to Pollok House is a herd of Highland cattle, which are of course are as archetypally Scottish as haggises and Nessie. 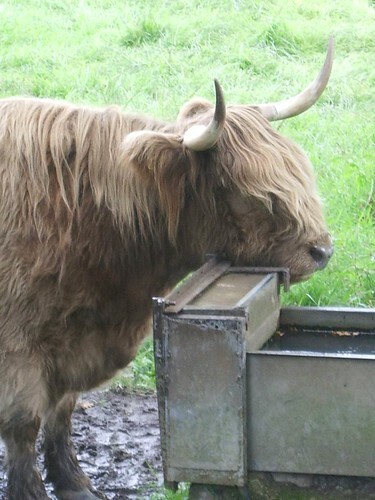 Known to the locals as “hairy coos”, I think they’re beautiful – though I wouldn’t want to get too close to those horns! 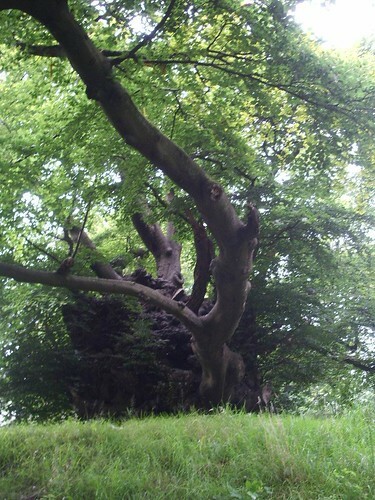 This ancient tree is on the site of the original Pollok House, up the hill a bit from the current one. There are all sorts of theories as to why it is so knarled and weirdly shaped (and not tall and straight like beeches usually are), from having branches hacked off for firewood to being cursed by witches. The most likely reason though, apparently, is some sort of fungus or infection. 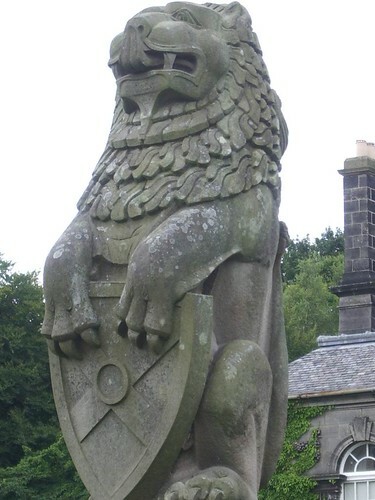 Yesterday’s lion was guarding the back garden entrance to Pollok House, which is a stately home in Pollok Park, a short walk from the Burrell Collection which I’ve featured here previously. 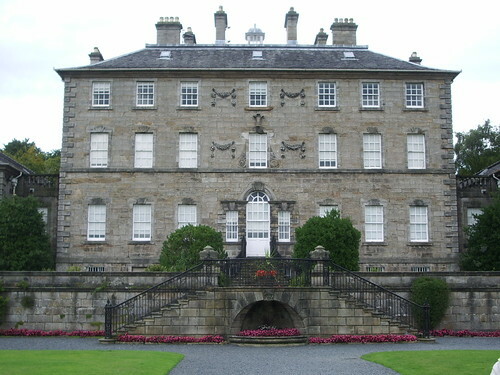 The Maxwell family lived on the Pollok Estate since the mid 13th century – this house though was built in the 18th century. It contains a large collection of paintings collected by Sir William Stirling Maxwell in the 19th century, including an El Greco, though I think my favourite room was the library. Wall to wall, floor to ceiling bookshelves – I was in heaven, although unfortunately us hoi polloi aren’t allowed to get the books out to look at as they are of course old and valuable. Some of the titles looked fascinating though – histories of Glasgow and Scotland, and one impressive looking tome on Manx Celtic Crosses, which I would have loved to flick through! There is a bit more information about the house here. Sadly taking pictures inside the house isn’t allowed, but I hope that this outside view gives some impression of how impressive it was. Tomorrow I’ll show you what this fellow (and his twin brother) were guarding. For now, today’s profound question is, of course, can you touch your nose with your tongue like he can? Glasgow is known for the River Clyde, but also has a number of other rivers. The River Cart is a very short (less than a mile) tributary of the Clyde, and is formed by the confluence of Black Cart Water (from the west) and White Cart Water (from the south east). 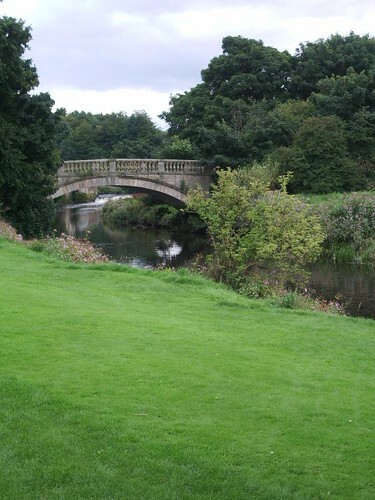 This picture is of White Cart Water as it meanders through Pollok Park. The Hub is to be a new all purpose student facility at Glasgow University, containing refectories, shops, pharmacy, a GP surgery and all sorts. Ever since I’ve been at the university the building has just been a concrete shell, but there has been building work going on the building for the last academic year, and at last it seems to be taking shape. 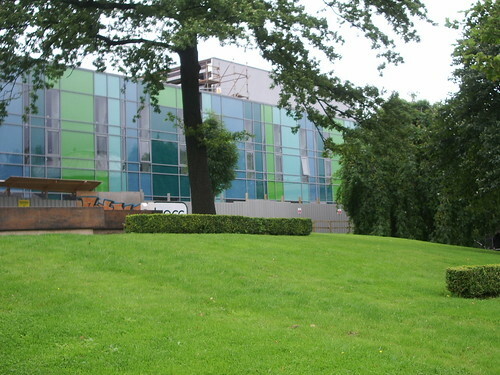 It’s situated opposite the University Library. 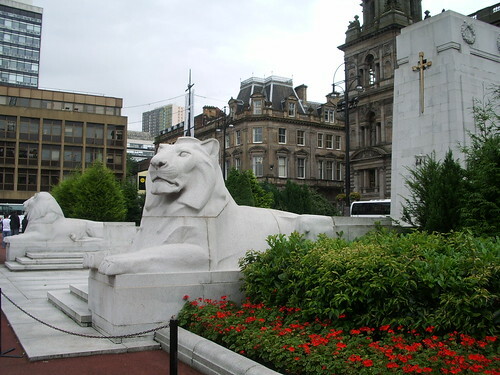 I’ve shown one of these George Square lions before in a night shot – here are the pair of them, guarding the War Memorial which sits in front of the City Chambers. I’m away for the Bank Holiday weekend, but magic pictures will still appear. 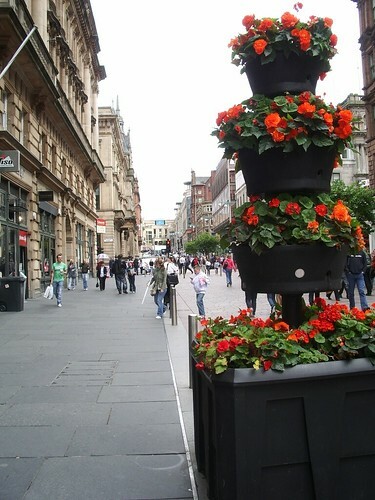 This year I’ve noticed loads of these flower boxes in the city centre and further apart, mostly with red flowers it seems. I rather like the effect. This is in Buchanan Street, one of our main shopping streets. The steps and columns from yesterday aren’t the only interesting thing about the Borders bookshop building. I’d never noticed this before, but this little sculpture in the wall is on the side of the bookshop. 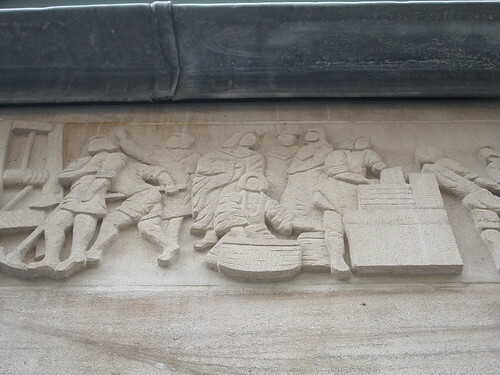 It is called Medieval Masons at Work, and was commissioned by the Incorporation of Masons of Glasgow. You might think these impressive looking steps and columns are part of a concert hall or museum, but they actually belong to the back of the Borders bookshop! Opposite you can see the back of the Gallery of Modern Art (GoMA) which has similar steps and columns out the front. 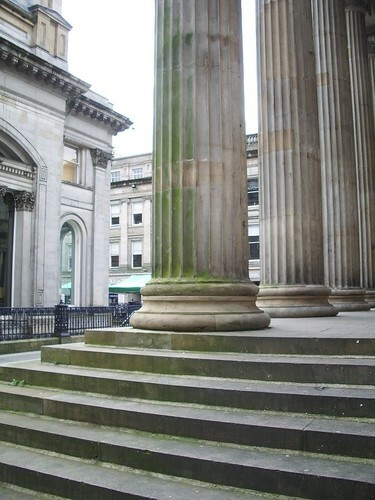 Until recently these steps were where Glasgow’s goths used to hang out on a Saturday. As I understand it they’ve recently been moved on, but I’m not sure where they’ll end up next. Before these steps they used to hang around at Central Station. I’m away for the Bank Holiday weekend, but magic pictures will still appear. In the meantime please head on over to South Shields Daily Photo, where Curly needs your support!